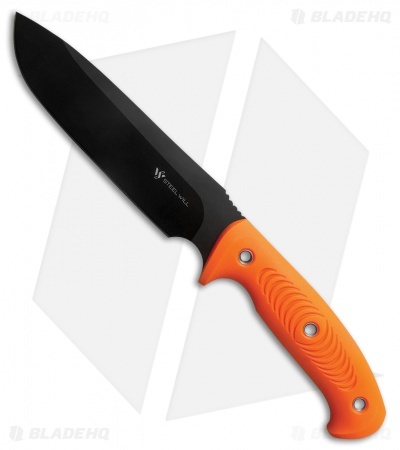 The Roamer R300-1OR by Steel Will knives is a rugged fixed blade knife with a black TiNi coated D2 blade and orange TPE handle. Able to withstand the hardest climates and situations, the Roamer will be a trusted companion for years to come. The 6.25" D2 stool blade is made from 0.20" tool steel, rugged, durable and capable of taking and keeping an exceptional edge, the Roamer can handle any task. A black TiNi coating prevents any oxidation from forming on the blade of the knife and adds an aggressive visual feel to the knife. Orange TPE handles are not only comfortable and secure in hand but allow for easy location if you have to set the Roamer down. The black MOLLE compatible belt sheath allows for easy carry in the field on your hip or attached to your gear.